A bride’s couture generally comprises of the colour red or maroon which stands for prosperity and fertility. In India red colour symbolises love, passion, commitment and purity. But are you one of them who wants to customise their Bridal Lehenga to tag themselves as an “Experimental Bride”? We have discovered few designers, colours and cuts to help you nail the “Experimental Bride” look on your D-Day! Colour of the Outfit: The colours of your wedding outfit aren’t restricted to just hues of red, you can experiment with bright pinks, blues, sea green, orange and off-whites as well. We suggest you try designers like Reynu Tandon who play around beautifully with colours whereas Tarun Tahiliani isn’t far behind when it comes to funky, bright pinks! Gaurav Gupta’s collections include Sea green which would sit subtly pretty in your wedding outfit. An off-white lehenga with heavy embellishments from Rimple and Harpreet Narula would make your wedding outfit stand out. Fitting of the Outfit: While we always believe that nothing can go wrong with a circular or a flared lehenga, you can always experiment with Fishcuts which are body hugging at the waist and flare at the bottom elegantly. We also love A-line lehengas from designers like Manish Malhotra and Harpreet Narula which fit at the waist and have minimal flares at the bottom. You can also try Asymmetric lehengas which have drapes clinging or pleats attached to the waistline panel to lower hemline furnishes for an unbalanced look. Ruffled lehenga adds instant barbie-look to your complete attire, try one from Manav Gangwani who masters edgy lehengas. Lehengas with Jacket are full flared lehengas with a long jacket on it. 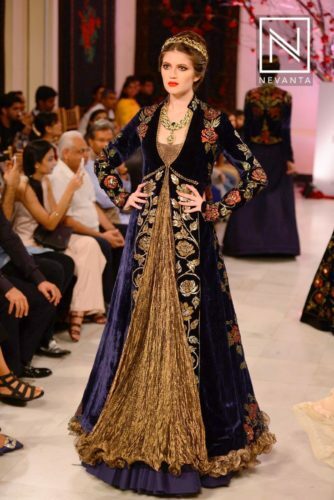 Choose a jacket that has embroidery weaving and heavy embellishments on fabrics like brocade, velvet or silk. 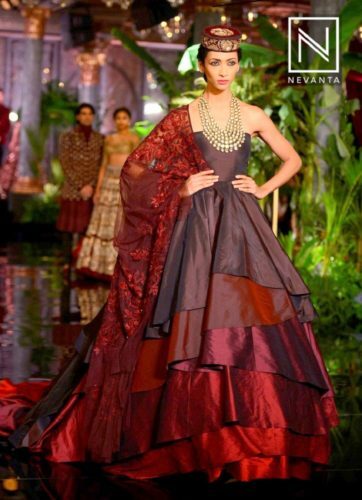 You can try Lehangas with Jackets from Rohit Bal and Sabyasachi Mukherjee that looks stunning. Hope this guide gives you a basic outlook to experiment with your lehenga for your wedding! Stay tuned for the next episode of Experimental Bride series.